Taste test: These kettle-cooked potato chips were fairly thin, crunchy and very crisp. The lime flavor seemed to be more dominant than the pepper. It wasn't so much a strong lime flavor as enough lime to kind of muddy up the pepper taste. 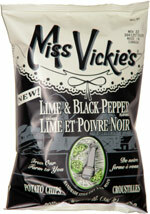 In terms of texture, these chips were excellent, but for taste I'd prefer a good salt and pepper chip, hold the lime. Smell test: Good peppery smell. No lime that I could discern.